Missives from the Art World: What's it worth? A short while ago I discussed how to recognize quality and pointed out that if one has only seen one painting by Monet it is both the best and the worst one that you have ever seen. In this missive I would like to discuss value and price. My father used to say, little differences in quality make big differences in price. Compare car models or cameras or whatever you shop for and I believe you will see that similar rules apply. 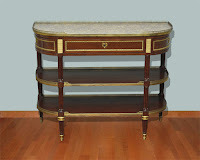 I want to look at two console-dessertes (sideboards) from our inventory. One is in the mid five figures and the other is in the low seven figures. Both are French 18th century from the same period 1780 -1790. Why such a difference in price? One is about 44 inches wide and the other is 45 inches. So, in this case size, does not matter! While you have been reading this you will have been glancing at the photos below and you have probably noticed without any prompting that one is rather simple and the other has more going on. Both have well-calibrated proportions. But now look on the first photo in this missive. 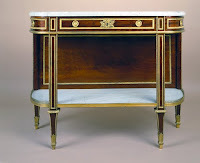 It is a detail of the mount at the center of the top drawer on the more elaborate console-desserte. It is a unique miniature composition of crossed laurel branches and a basket of flowers. If you could touch it (and you can if you come to the gallery…we are not a museum), you would find that it is beautifully chased and not sharp like gilt bronze mounts of the 19th century. The other console-desserte has keyhole mounts of a Louis XVI model you will find on other pieces because the bronze-maker supplied it to various cabinetmaker clients. If you look behind the more elaborate piece you will find a partial stamp showing a crenellated circle above G.M. This identifies the console-desserte’s original provenance (for whom the piece of furniture was made). It is the inventory mark of the Pavillon de Saint-Cloud, 1786-1789), the modest retreat purchased by the Comtesse d’Artois, wife of the younger brother of Louis XVI who was to reign as Charles X. That this piece was made for a celebrity of the time adds interest and value. Just as one might pay a premium for something that belonged to Jackie Kennedy Onassis or any other celebrity. The story of why it was commissioned is also amusing and we can tell you that when you come to see the piece in the original (or you can look at our website and read the story). But remember no matter how much you read or look at photographs there is no substitute for viewing the actual work of art. Then it will either sing to you or leave you cold!